Redd Kross, a rock band from Hawthorne, California had their roots in 1978 in a band called The Tourists begun by Jeff and Steve McDonald while the brothers were still in middle school. With the addition of friends Greg Hetson and Dave Keller on guitar and John Stielow on drums, the band's first gig was opening for Black Flag. At the time of their first self-titled EP, in 1980, the band changed their name to Red Cross, which was allegedly inspired by the masturbation scene in the film, The Exorcist. At the time of their first self-titled EP, in 1980, the band changed their name to Red Cross, which was allegedly inspired by the masturbation scene in the film, The Exorcist. Ron Reyes became the drummer. Eventually, Hetson left to join the Circle Jerks (and later Bad Religion) and Reyes left for Black Flag. Keller left to join Trixie and the Doorknobs as its guitarist and singer. To complete the lineup on their first full-length album, Born Innocent, they assembled a revolving door of musicians including original drummer John Stielow and drummer Janet Housden. 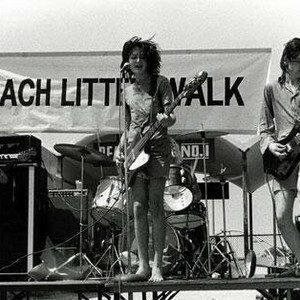 Full of the brothers' pop culture obsessions, Born Innocent featured odes to Linda Blair (who starred in a television movie of the same name), a cover of "Look on Up from the Bottom" by the Carrie Nations from Beyond the Valley of the Dolls, and Charles Manson (whose song "Cease to Exist" they covered). The album also contains nods to Jim and Tammy Faye Bakker, Tatum O'Neal, and Lita Ford. Not long after the release of the album, the group was threatened with a lawsuit from the International Red Cross and changed their name to Redd Kross, allegedly being inspired by Redd Foxx. In 1984, Redd Kross returned with drummer Dave Peterson to record Teen Babes from Monsanto, an album featuring songs originally by such artists as KISS, David Bowie, The Rolling Stones, and The Shangri-Las. In that same year, they were featured on the soundtrack of Desperate Teenage Lovedolls with their cover of the Brady Bunch Kids' "It's a Sunshine Day". Jeff and Steve appear in the movie, along with Robert in the sequel Lovedolls Superstar which the brothers co-wrote with Dave Markey and Jennifer Schwartz. Both movies are available now on DVD. In 1985, drummer Roy McDonald (formerly of The Things, and no relation to the brothers) joined the band. In 1987, Redd Kross released Neurotica, an album reportedly influenced by Saturday morning cartoons and breakfast cereal (one of the songs was called "Frosted Flake"). Although the album itself was successful, the band's label, Big Time Records folded. The band continued to tour during these years however, and in 1988, drummer Victor Indrizzo joined the band. On February 20, 1990, Redd Kross appeared on Episode 2 of the cult Public-access television show "Decoupage" with Summer Caprice. In 1990, Redd Kross signed with Atlantic Records, releasing Third Eye, and appeared with David Cassidy in the film Spirit of '76, and issued several singles, including "Annie's Gone", which had some mild success on college radio. Former Red Hot Chili Peppers / future Pearl Jam drummer Jack Irons joined for the Third Eye tours, and appears in the promotional video for "Annie's Gone", which saw some light rotation on MTV. Brian Reitzell succeeded Irons as drummer in the band, and appears in the promotional video for "1976". In 1991, Robert Hecker took leave from the band. The album Phaseshifter was released in 1993, with new band members Eddie Kurdziel, Gere Fennelly, and Brian Reitzell. The videos for "Jimmy's Fantasy" and "Lady In The Front Row" were both shown on MTV's 120 Minutes. They toured on Phaseshifter for over a year, headling their own shows as well as tours supporting The Lemonheads and The Spin Doctors in late 1993 and Stone Temple Pilots in 1994. In 1995, Jeff and his wife, Charlotte Caffey (from The Go-Go's), had a daughter, named Astrid. In 1997, Redd Kross released Show World, produced by Chris Shaw (who also produced albums for Weezer and Soul Asylum) and toured supporting The Presidents of the United States of America. The band took an indefinite hiatus after the Show World tour, and their future was uncertain after the untimely death of guitarist Eddie Kurdziel on June 6, 1999. On July 1, 2006, Redd Kross returned to the live stage after almost a decade's absence. The Neurotica-era line up of Jeff McDonald, Steven McDonald, Robert Hecker and Roy McDonald performed a career-spanning set at the REDCAT (Roy and Edna Disney/Cal Arts Theater) at Disney Hall in Los Angeles. The band has subsequently gone on to play at the Azkena Festival in Spain, the Detour Festival in Los Angeles, give a performance of their entire first EP in honor of Rodney Bingenheimer's being awarded a star on Hollywood Boulevard, and a set consisting of the entire Born Innocent album opening for Sonic Youth (who performed Daydream Nation) at the Greek Theater in Los Angeles. They toured Spain and England in January, 2007. They have played a number of one-off shows including Los Angeles, New York, Chicago, and San Francisco. In 2008 they played the Coachella Festival in Coachella, California; ATP vs Pitchfork festival in Sussex, England; and NXNE Festival in Toronto, Ontario. In 2010, Redd Kross headlined the Turbo Rock Festival in Spain. In 2011 they headlined the POP Montreal Festival. Redd Kross will tour Australia again as part of the Hoodoo Gurus' 30th Anniversary on the "Dig It Up" Festival concert series. The band expects to release a new album in 2012.